I hope that this post will be a tribute to the innovative designs of the late Bill Brown. The original Percy came as an A4 design from the Hip Pocket forum plans download. I did kit this but argued that it was a trifle small for the anticipated 7mm pager motor. 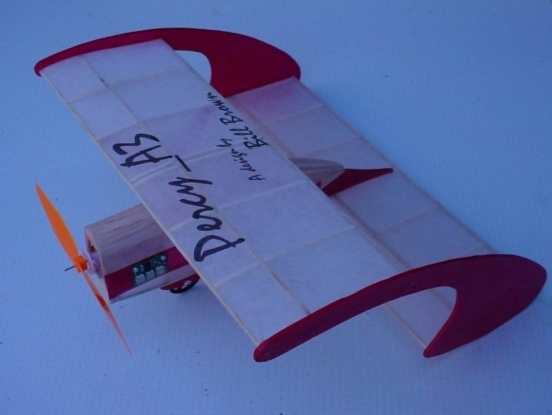 Accordingly, my good friend Ted Szklaruk enlarged the plan to A3 size and Percy_A3 was born with a 260mm wingspan (10.2"). This is basically built from 1/16" square medium with tissue printed Esaki covering. I did have problems with warping of the 1/32" balsa vertical members connecting the horizontal surfaces but adopted a 1.5mm Depron solution with Johnsons Klear as a tissue adhesive and finish. The power unit was a geared 7mm pager from Robotbirds with an integral 3amp brushed ESC (408215) driven from a 35sec kpaero controller (Flitehook, Auntie Pauline) with a 50mah LiPo battery. Propeller is the ubiquitous GWS 5 x3. AUW is 28gm and the CG is about 40%. I have no idea if this is OK or not. I thank Bill for his design and hope that he would approve.of the modifications.